Jomres comes with a pre-defined base of more than 55 business features which you can customize as you see fit and add to your properties. To add a new Business feature you will need to access you Jomres dashboard and navigate to Site Structure>Business Features section of your main panel. Click on the +New button located at the top left corner of the page. Once you have configured the new business feature, click the Save button to create it. In the previous step, we created a business feature. However we didn’t put a short name in the Business feature abbv field and now the feature is now showing the entire name. We will have to click on the Edit option next to the feature in order to edit it. Now we can fix the Business feature abbv and simply make it WWW. Click the Save button to apply and save the change and now you have a nice new business feature for your properties. Login to your website’s front-end with your Super User credentials and find the property you wish to add the new feature to. In this example we will use the Cottage property CuteCottage. Navigate to the Settings>Property details section of the property. Now scroll down till you see the Features section of the property. 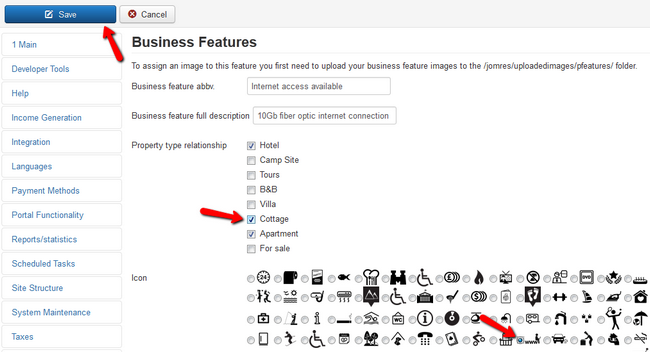 Here you can see all features that have Cottage selected in the property type relationship. Select the feature we added and click the Save button at the end of the page. You have successfully added a business feature to the property. Only one feature is not enough! Provide and add more features to make your properties more desirable for booking.